Life Between Pages: Life of Pi DVD giveaway – the winner! 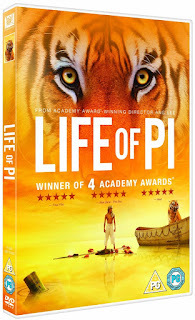 I'm happy to announce that the winner of my Life of Pi DVD giveaway is Helen Dickinson! Congratulations, Helen! I've sent you an email, and you have one week to respond before the giveaway is redrawn. To all who missed out, don't worry – I'll be holding more giveaways in future. Stay tuned!